We’re back in Australia. This time we brought Helena along! Our original plans were to go from the Solomons along the coast of PNG through the Torres Strait to end up in Darwin. However, due to an unreliable engine, two furling systems in need of repair and a broken genoa, we decided to take the easiest and quickest route to a place for repairs and sailed to Cairns. 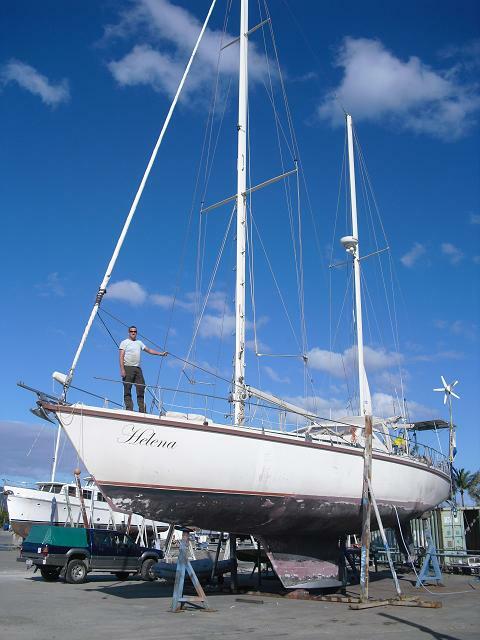 After crossing the Pacific Helena needed a little make-over, so she’s been out of the water for the last three weeks. She’ll be as good as new when we’re done, new engine, hull repairs, new anti-fouling, repaired sails, new couches and curtains and all kinds of small but annoying problems fixed, but it’s a lot of work. And for the moment it looks a bit like a bomb exploded on board. But, pictures of the new and improved Helena will follow soon!